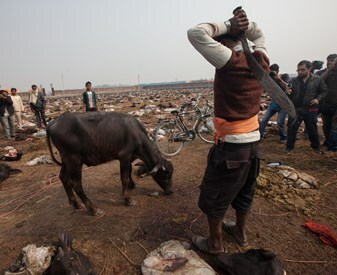 A butcher raises his blade over a buffalo calf before severing its head during a mass slaughter of buffaloes for the Gadhimai festival inside a walled enclosure in Nepal’s village of Bariyapur, near the Indian border, on November 28, 2014. 29 July 2015 – It’s the world’s largest single-location animal sacrifice event and is held in the Gadhimai temple grounds every five years; with tens of thousands of animals sacrificed. The importance of the announcement on 28th July and the impact it will have on thousands of animals cannot be underestimated. It comes after rigorous negotiations by Animal Welfare Network Nepal (AWNN) directly with the Temple Trust . Our supporters played a major part – your donations were used to fund educational and campaign materials that were used by AWNN in Nepal. 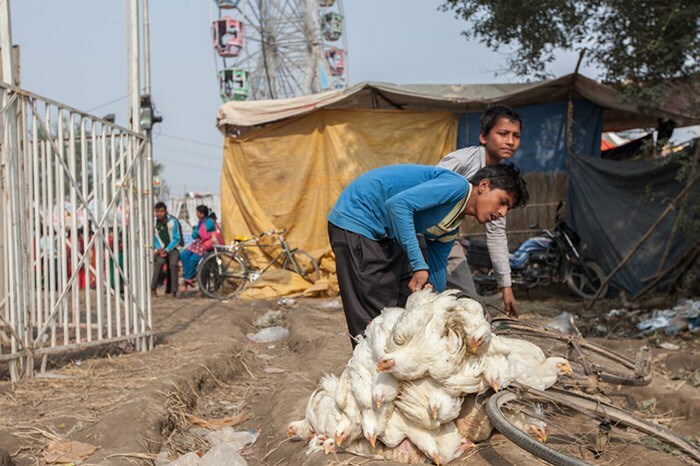 Our campaigns team and over 134,000 supporters addressed the Nepalese Government, pushing for a ban on slaughter at all festivals in the country, of which Gadhimai is the largest. It’s estimated that more than 500,000 buffalo, goats, chickens and other animals were decapitated at Gadhimai in 2009, but in 2014 the numbers had reduced significantly after an intense local campaign and the Supreme Court of India had prohibited the movement of animals across the border into Nepal. AWNN have expressed their deep gratitude to everyone from around the world who supported their local voice with a global voice. The animal massacre captured the public attention when hundreds of thousands of national and international supporters expressed their shock at the scale of the killing with protests held worldwide. This is a ground-breaking moment for the animals, but AWNN have said there is still much work to be done in preparation for the next festival in 2019. Grass-roots education work and campaigning will be needed to ensure that the devotees adopt a new way to partake in the festival; one that celebrates life instead of death. 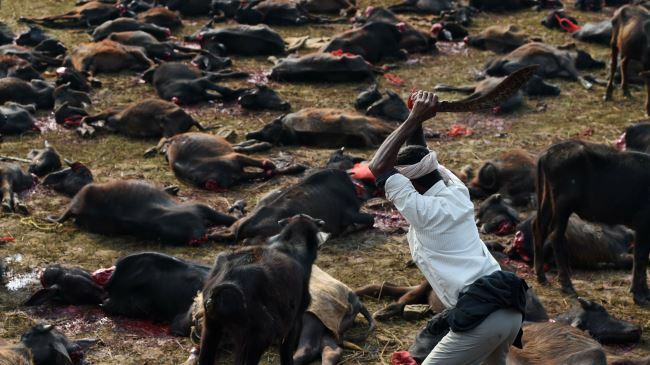 Without an official organisation lobbying for the continuation of animal slaughter, it’s now hoped that this landmark decision at Gadhimai represents a catalyst for the Nepalese Government to enforce an outright ban of all sacrificial slaughter at festivals in Nepal. Compassion in World Farming was founded over 40 years ago in 1967 by a British farmer who became horrified by the development of modern, intensive factory farming. Today we campaign peacefully to end all factory farming practices. We believe that the biggest cause of cruelty on the planet deserves a focused, specialised approach – so we only work on farm animal welfare. We are immensely proud of what we have achieved so far.